Officials in Montgomery County are saying that there is no evidence a crime was committed in the deaths of an elderly couple found outside their Whitemarsh Township home last month. 81-year-old Rhoda and 86-year-old Ross Woodward were found by a postal worker at their home on Bethelehem Pike near the PA Turnpike on December 4, 2018. The coroner's office said that Ross died from Atherosclerotic Cardiovascular Disease. Rhoda died from blunt impact trauma to the head followed by hypothermia. The manner of death, however, was ruled undetermined. Governor Tom Wolf has declared a state of emergency for Pennsylvania ahead of this weekend's snow storm. The storm is expected to bring heavy snow, significant icing, rain, and winds across the state. There will be a ban on commercial traffic including busses on the Turnpike and interstates (except I-95 in Southeastern PA) from noon Saturday to noon Sunday. A 45 mph speed restriction on highways will also go into effect. Amtrak has canceled the cross-state passenger train for Sunday and six Keystone Line trains on Sunday. The Philadelphia area will probably miss the brunt of the wintery precipitation but roads will still be messy. It will start as snow on Saturday afternoon, accumulating an inch or more, before changing to rain. On Sunday, precipitation could change back to snow for a while as temperatures plunge causing a flash freeze. South and east will get more rain. North and west could get significant ice and far north and west will see a foot of snow. All schools in the Upper Merion Area School District were closed on Friday, 1/18, not because of the winter weather, but because of an online threat of violence. 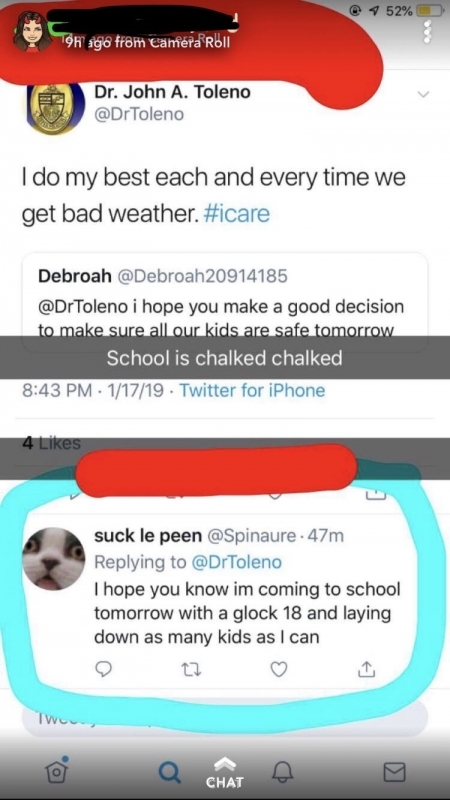 School district superintendent Dr. John Toleno was on Twitter on Thursday night, 1/17, keeping parents and students informed and answering questions about this morning's snowfall, when someone responded to him with a threat. The tweet has been deleted and the account responsible has been suspended, but the user talked about shooting students. 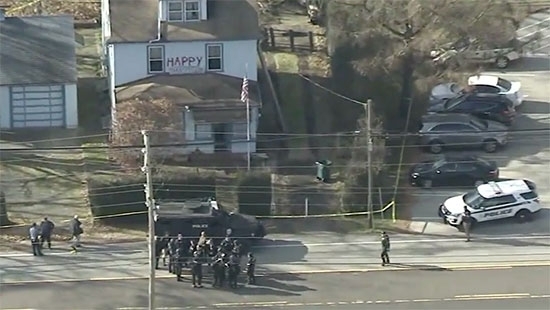 (see screen capture below) Upper Merion police and the FBI are investigating. Dr. Toleno considered having schools open with increased security and police presence, but after consulting with authorities the decision to close was made in the early morning hours. The investigation is still ongoing. Viking Nation, please be advised that I was just made aware of the very inappropriate Twitter message that was sent to me. The Upper Merion Police are diligently investigating and they along with the Bridgeport Police will have a heavy presence at all of our schools tomorrow.